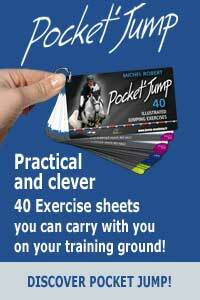 A comprehensive exercise to set-up all the key elements for a successful jumping course while having fun: a well seated rider, straight jump approaches and landings, some curves well executed, some flying change of leads and yet being in control with a steady rhythm. Michel is teaching Marine and the horse Vivaldi, a stallion owned by the Haras de Hus. The exercise takes place in a field next to the stable. As already said, training the horse outside of the ring not only improves the horse’s level of fitness but it also makes him feel better mentally. At first, Michel sets up small fences on a serpentine track. This is to make sure that Marine is able to properly manage the tasks set-up by Michel. After Marine went successfully over the exercise several times, Michel raises the height of the fence. He insists on the fact that the rider has to imagine the exercise as successfully achieved as difficulties arise. If one thinks he can’t do the exercise, it will lead to a failure as one programmed it negatively. On the other end, if the rider visualises mentally the exercise being successful before practising it, then he will be able to instinctively react to the situation with some light and useful actions. 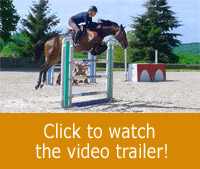 The fences on this exercise can be swapped with some oxers or small combinations. It matters that everyone is having fun, and that the session ends up well.